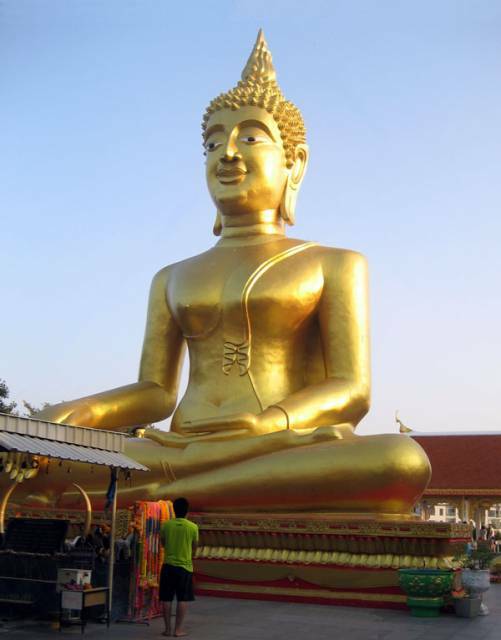 Big Buddha statue is located on Pratamnak Hill (Khao Phra Tamnak) in Pattaya. Hill is located between the downtown and Jomtien district. There are a Buddhist temple (Wat Khao Phra Bat) and a large number of interesting sculptures and installations on the hill. On top of the hill is a big (height 18 meters), gold plated statue of Buddha. This attraction is located at walking distance from the city center. The photo was taken in December 2013 during a trip to Thailand. Pattaya attractions and interesting places location is pointed on the map.